March 18, 2015, 10:42 PM · In early February, violin soloist Julian Rachlin wrote on his Instagram that he was "beyond excited to try out my brand new Benoît Rolland bow tonight with the Boston Symphony. I've been waiting two years ..."
I first learned of Rolland's bows when Anne-Sophie Mutter mentioned in a 2008 interview that she regularly uses one. I thought this would be a great opportunity to talk with Julian Rachlin, and so while he was in Detroit for a concert series, we had a wonderful talk over the phone about Rolland, finding the ideal bow, playing viola, and keeping balance as a touring violinist, violist, teacher and now, conductor. Julian Rachlin. Photo by Janine Guldener. Julian, a native of Vilnius, now lives in Vienna, where is where he grew up, from age three. 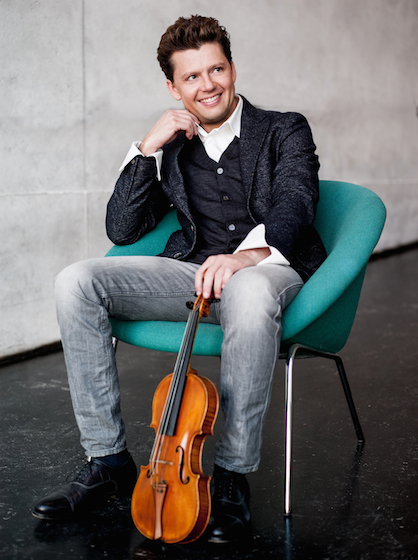 But he's not often at home -- this season he has kept an especially busy performance schedule, with concerts in Europe, Asia, and North and South America, playing as a soloist with some 20 different orchestras. In the fall he will begin his first conducting position as principal guest conductor of the Royal Northern Sinfonia. He also continues to teach at Vienna University and will teach masterclasses at the Kronberg Academy in the fall. Laurie: What made you start playing the violin in the first place? Julian: The violin was quite an accident, because I always wanted to be a cellist. My dad's a cellist, and still today the cello is my favorite instrument. I guess that's why I play viola -- it's the closest I can get to the cello, being a violinist. But the way it happened: the grandparents came home one day with a violin and lied to me. I was two and a half years old and they said, 'This is your cello!' So I started playing violin, holding it like a cello. Then when dad took me to the orchestra rehearsal of the orchestra where (my father) was playing, still back in Lithuania, I saw that what I had at home was not a cello. Then we moved to Vienna and I just kept playing violin, and somehow I got stuck with it." Laurie: At what point did you take up the viola? Julian: That was when I was studying with (Pinchas) Zukerman, in 1994. Laurie: Was it his idea? Yours? Julian: It was his. He said this would help my violin playing and that every good violinist should play viola. I've been on the faculty of the Vienna University for 16 years, and all my students play both instruments. I believe in that, because I saw the difference it made for my violin playing, and for my growth as a musician, to play the viola, and especially to discover chamber music from the viola part. It's something I can recommend to every violinist. Laurie: In what other ways has the viola helped your violin-playing? Julian: Technically speaking, you start understanding more consciously the role and the importance of the right hand, of the bow arm. The bow arm is the most important thing about violin playing -- this is the painting hand. Playing viola as a violinist, you can experiment a lot with the bow arm, and it gives you more possibilities. You learn so much about the speed, about sound colors. Laurie: In what way is the right hand and bow different, playing viola? Julian: You need more weight, and the bow speed is different, both if you want to play something condensed, or if you want to use more air, "flautando." Also, the ideal sounding point is farther away on the viola, obviously, because it's a bigger instrument than the violin. But so many violinists, when they want to play something very forte expressivo, they play too close to the bridge, which is a complete misunderstanding. If you want to achieve maximum sound, the last thing you have to do is go closer to the bridge. Julian: It's all about finding the right sounding point and the right angle for the bow, in relationship to the bridge and to the string, and the right speed. It's all about the speed, it's all about saving the bow as much as you can, and accelerating the speed of the bow, without anybody noticing. Very difficult to explain over the phone! In any case, it's very fascinating to experience all of these hundreds of different elements, on both instruments. Laurie: Do you find it at all difficult to switch between the two instruments? Do you play violin and viola in the same performance? Julian: Yes, all my recitals are mixed with both instruments. Difficult? Yes. Everything you want to do well in life is difficult! If you want to do something really well, it's never going to be easy. Anything that comes easy -- smells, to me. Even if I want to play just a simple melody, if I want to play it really well -- I would love to eliminate the word "easy" for classical music. This term should not be used. (He laughs) It has to appear easy, once you're on stage. It has to appear as if it's the most natural, easy thing. But it is never easy to achieve that. Laurie: Tell me about your new bow, made by Benoît Rolland. What made you decide you needed a new bow? Julian: It's not about needing, I have a wonderful modern bow that I've been playing with since 1990, a Daniel Schmidt. I'm a great fan of his. What Benoît Rolland is in America, Daniel Schmidt is in Germany; he's one of the great bowmakers. He was in Dresden. So I have other bows; I'm still looking for a Tourte, and it's my dream to have a François Xavier Tourte. But I love playing on great modern bows as well, and Benoît Rolland is one of the finest bowmakers, undoubtedly, of today. Because he is a mixture of the great old school of the French masters, like Tourte -- Tourte is his idol, he says himself. So this (new bow by Rolland) has a soft and buttery feel, when you play it. The bow just dives into the string, and you don't really have to do much, it lies so beautifully on the string. Yet it has this very modern touch; it's soft and very strong at the same time, which I think is the most difficult to achieve in bows. Either bows are extremely soft and you can only play certain repertoire on them, or they are very modern and tight and strong, but then they don't have these magic soft, sensitive colors. Benoit Rolland is one of the very few makers who have worked that one out. He followed the tradition of the great bowmakers of the 19th century, and he has wood. He really is obsessed with bowmaking. He has created a lot of new inventions, he invented this incredible new frog, two years ago, which is in a way, a revolution. Laurie: A new kind of frog? Julian: It's built in a totally different way; the hair of the bow doesn't start straight; it starts at an angle. So he is always experimenting; he's not scared of coming up with quite revolutionary new inventions. His mind is full of ideas about how to take the mastery of bowmaking further. He's an incredibly generous human being. When he builds a bow for an artist, he wants to get to know the artist personally, and to get acquainted with the style of the violinist, the violist, the cellist. He built two bows for me: a violin bow and a wonderful viola bow. He said that he spent a long time listening to my recordings, and he went my concerts. He goes right into the depths of things; he's definitely not a bow maker that will make bows like a factory in order to sell as many as possible; he is a person of highest integrity and he really takes time. It's not a surprise that so many string players have Rolland bows. Laurie: How can you identify a good bow? What kinds of tests do you do on it, and how do you know? Julian: It's experience. Certain strokes have to be really comfortable to play. It has to have this combination, that the bow is not nervous, that it's balanced, that you can lift the bow and when you have virtuosic pieces, when you jump from G to E string and things like this. And it's about proportion. People like to ask, how heavy is the bow? But it's not about how heavy or light the bow is in grams; it's not about how much it weighs. It's about how the weight is balanced. You can have a very heavy bow, which, if it is balanced perfectly, it will feel like a light bow. Also, it is extremely personal. So I would be very careful to advise a young player -- what feels right in my hand will most likely not feel right in his hand or The higher the level of the player, the more he or she will also know what he wants and what feels right in his hand. Laurie: But a Tourte feels good in anybody's hand. There must be a few things that are universal about it. Julian: Yes. If you hear the overtones, if you can make a good spiccato at the tip of the bow, that's a good sign. Not completely at the tip, but pretty high up. If a bow lies really well -- you have to test how is it to play chords with the bow. How is the spiccato, how does it think, does it have a soul? Does the bow have a soul? How difficult is it to achieve a big variety of colors? It's not just the instrument. Fifty percent of the sound, in my opinion, is the bow. The beauty of the sound is only half the instrument. The other half is the bow; it's equally important. (To test bows), just play the same thing, a short passage, and take 4-5 bows. Or have someone else play, and listen in the hall. They will feel an enormous difference: the same instrument, with five different bows, it's like five different instruments. Five different players. An enormous difference. Laurie: I noticed that you are traveling absolutely all over the place, keeping an extremely busy schedule of performing, teaching, and now conducting. Julian: Yes, but I must say that I feel totally inspired, totally fresh, although it's my 27th consecutive year. Laurie: How do you keep your health, when you're traveling so much? Julian: I choose all my hotels according to the size of the swimming pool. The first thing I do when I open my eyes, five minutes later I'm already swimming and doing laps for 30 minutes. Then I go to the steam, ice-cold shower, and now since last October I've been obsessed with playing tennis. So I'm traveling everywhere with my double case, violin/viola in the left hand, and two tennis rackets and my tennis outfit in the right hand. So I try to balance it. Of course it's all about music, and about preparation and practicing. I spend hours figuring out the scores, keeping in shape on the violin, and doing the 24 Paganini Caprices -- never on stage, so nobody can hear it. But this is like my workout, to keep in shape on the violin. But I also doing sports. I love to cook when I am home, which is not very often, but when I am at home, I'm a passionate cook. I love to go to the market, and it's kind of a meditation as well. For me, it's important to switch off my mind. It's so incredibly focused on music; it's important to find those times, even if they are little, to consciously also know when not to touch the violin or when not to do anything. It's just clearing your mind on a regular basis and staying curious. It's about timing and it's about preparation, and it's about knowing your own pace, you're own rhythm. Somebody maybe will learn a new piece in two weeks; I prefer to take a year. It doesn't make me a bad musician; it's not the speed, it's about what you want to say in music, and if you want to say something in music, it's got a lot to do with time. You need to grow. You can't just say, "I will not touch Bach until I'm 80"; you have to touch it, you have to do it. But it's a very long process. It's about sustaining life with music, sustaining it through your whole lifetime, because a lifetime is not enough to discover all the secrets of the great composers. I was never just classical violinist who just plays Brahms, Tchaikovsky and Beethoven up and down; I love to teach, I ran my festival in Dubrovnik (Croatia) for 20 years, I'm crazy about chamber music. And now I'm experiencing music from a totally different angle by diving into the world of conducting. Laurie: Do you have a mentor in conducting? Julian: Yes, absolutely -- my mother (Sophie Rachlin) is my daily conducting teacher. At first, I didn't want to study with my mother. But when I asked Mariss Jansons if he would teach me, he said, "No, I won't." I said, "Why?" I mean, he's a dear friend, he's like a second father to me. He said, "Because it's not as easy as you think, to go in front of an orchestra and start conducting. If you're really serious about it, you need somebody you can take regular conducting lessons with, and I don't have the time for that. But there is one person who is the only person that I trust 1,000 percent." And I said, "Who is this person?" "Your mum." My mother graduated from St. Petersburg Conservatory in choir conducting, together with Gergiev, Semyon Bychkov and Mariss Jansons and all these great Russian conductors. That was a golden era for the conducting school at St. Petersburg, it was amazing. So I didn't want to take lessons from my mom because my mom is my mom! But then when Mariss Jansons told me to do it, I thought okay, I'll take one lesson. Laurie: And what did she think? Julian: She was the one telling me that we should start seriously, and I was saying no, I'm going to learn from all the great conductors that I'm performing with. Then I was so impressed with her knowledge and the way that she teaches -- I continued, and now it's been five years. Of course I also have mentors who are known conductors, people who are regularly very involved in my development: Mariss Jansons, Daniele Gatti, Leonard Slatkin and Donald Runnicles. And Riccardo Chailly has looked at my conducting, has given me tips. Of course I'm using this incredible luxury of being on stage with these great maestros and asking them for their time in between concerts and rehearsals on tour, to get tips and to get information. But I take that extremely seriously, I really want to learn conducting in a serious way. Laurie: It sounds like you are in very good hands! Here is a brief clip that shows Julian, both playing and conducting from the first movement of the Mendelssohn, with the Israel Philharmonic. March 19, 2015 at 12:57 PM · Wonderful interview. How insightful. Thanks! March 20, 2015 at 01:19 PM · This is a really great interview--Laurie one of your best! March 20, 2015 at 04:41 PM · I would like to see a picture of this "bow hair starting at an angle" or perhaps we could know what the angle is. March 21, 2015 at 10:41 PM · Goto Rolland's web site, he has pictures of it there. What it does is you can have your hand curved towards the fingerboard and the bow still lays flat on the string. March 22, 2015 at 09:56 PM · Thanks, Laurie. Lots of things to think about.